The Central Environment Authority (CEA) is to ban the sale of carbonated drinks and fruit juices in PET (PolyEthylene Tetraphthalate ) bottles below 1 litre, to control the plastic menace in the country. CEA Waste Management Director, J.M.U. Indraratne said that, instead, the Beverage industry will be encouraged to sell drinks in glass bottles. However, the industry could use PET bottles of 1 litre or more, for their beverages. Water will be exempted from the law. He said this would minimise environmental problems caused by plastics. It is also intended to curb haphazard disposal of and burning plastic bottles, causing health hazards, together with economic and social problems. The CEA, at the end of the 2016 Siripada season, collected 5.5 tons of PET bottles and 830 kg of plastic waste. In a Polythene/Plastic and Electronic Waste Prevention Week in October last year, involving all Districts, the CEA collected 71.59 tons of plastic/polythene and 440.38 tons of e-waste, with Colombo contributing the highest of 222,738 kg of e-waste and 9,225 kg of plastic/polythene, while Mullaitivu contributed 845 kg of e-waste and 165 kg of plastic/polythene. Mr Indraratne said that plastics was losing its value in the world market. He said 1 kg of recyclable plastic earlier fetched up to Rs 46 per kg but now, it has come down to Rs 6 per kg. 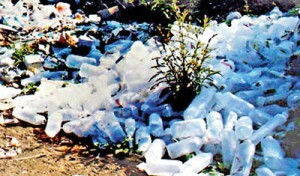 Consequently, many people who collected and sold used plastic bottles, have abandoned the trade. The CEA says the use of glass bottles, while greatly reducing the amount of discarded bottles, will also have a recycle value. Additionally, the CEA will also ban the import of recycled raw material and the sale of lunch sheets below 40 microns, in the local market. At a CEA Expert Committee meeting in November 2016, officials from the CAA, Ministry of Health, university Researchers and industrialists related to plastic manufacture discussed a future action plan for a national policy to manage plastic, by initially doing away with lunch sheets, and then increasing the thickness of shopping bags to 40 microns. Mr Indraratne said a Cabinet paper will be submitted for approval, soon. Advisory Committee Chairman, Anton Hemantha said that, “However, the Packaging industries were not consulted in the decision making. He opined that, banning PET bottles below 1 litre capacity, will be disastrous for the Beverage market. He said PET bottles are very handy with soft drinks and yoghurt packaged in economic PET bottles. Moreover, thousands of tourists visiting the country opt for the PET bottled drinks. “We need economical plastic bottles,” he said. “We need lunch sheets to wrap takeaway food and shopping bags over 40 microns will be costly. Supermarkets will pass the buck to the customer,” he said. To produce high density polyethylene for shopping bags, more raw material has to be imported with extra money spent on it. Currently, 1,400 metric tonnes of raw material is imported. Again the disposal of the thicker gauge will prove even more difficult. Mr Hemantha conceded that, while the world is going in one direction, producing thinner gauge plastic, Sri Lanka is taking a u-turn. A PET bottle manufacturing company for leading brands of carbonated drinks and fruit juices said the ban on economy sized PET bottles will have an adverse impact on the economy. They said the economy bottles are for third world countries, whose people cannot afford the big bottle. The Packaging industry will support the government, if it comes forward with a proper mechanism for the disposal of plastics. It was argued that, substituting glass bottles will only create additional weight, cumbersome handling and increased transport cost.